Russians used to celebrate what they call the “old style” Christmas on December 25th which was mostly a religious celebration, (very little commercialism - meaning no singing bass with Santa hat mounted to the wall). Decorations were somewhat limited to ornaments on spruce trees with star on top. During the Soviet era, starting in 1917, all Christmas celebrations (and New Years eve celebrations) were illegal. Soldiers and guards looked into windows of homes to make sure there was no celebrating. All production of ornaments and decorations ceased. Only foreign embassies celebrated Christmas. Children grew up knowing nothing about Christmas...until one day...in 1935...Stalin and his family attended a holiday reception at the British Embassy in Moscow. Stalin’s daughter, Svetlana, asked her father why they didn’t have a huge Christmas tree with decorations. From that day forth, celebrations were allowed in Moscow, but not to celebrate Christmas....only to celebrate New Years Day. So, all former Christmas traditions were moved to New Years Day traditions. 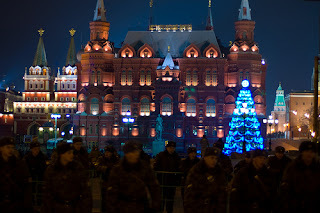 And, to this day, the big holiday celebration in Moscow is New Years Day (they do not have a December 25th celebration). They also have a Russian Orthodox Christmas that follows the Gregorian calendar. The Russian Christmas is celebrated on January 7th and is mostly religious with a midnight church service (most churches do have trees and candles to celebrate). Russians exchange their gifts on New Years Day. Most spruce trees (“New Years” trees) are sold starting December 25th. When the holidays are over, some people chop off the branches and carve the date into the tree trunk as a memento from the holiday. They will collect these over the years. If you buy your tree at IKEA, at the end of the holiday, IKEA will buy your tree back and reuse the wood. No wonder that bookshelf is so lopsided! The Kremlin has the biggest and best tree in Moscow (similar to our Rockefellar Center tree) and it is delivered by helicopter. It has a theme each year and is decorated with ornaments that represent a historical event (i.e. Sputnik space travel). Their Santa Claus is “Father Frost” (again, no Christmas connection). He is a grandfather and has an assistant (like an elf) called the Snow Maiden - some say she is his granddaughter. Parents put all their children’s gifts in a big sack and a live Father Frost visits each house (apartment) on New Years Eve. The parents like to celebrate with the Father F and offer him shots of vodka....apparently he can hardly walk by the end of the night. And what child doesn’t like a tipsy Santa to kick off the celebration?? From December 20th to January 10th, the Kremlin Palace holds a children’s performance and the audience is children only - 6,000 a day! The parents must wait outside on the outskirts of a big square, (there are adults inside who help the children with their coats, etc.). When the performance is over, each child receives a box with a gift inside - usually chocolate. They then go outside and parade in a circle around the square until they spot their parents in the crowd. Fairly amazing - don’t you think? Apparently this was a very special event during Soviet times...now the children are hoping for a video game in their gift box rather than chocolate! If I may offer a correction to your story. Lenin died in 1924. He was not known to have any children. I think Stalin with his daughter Svetlana (Allilueva) attended the Embassy reception. Merry upcoming Christmas! By the way did you know that Svetlana lives in the US? Ohhhh....thank you so much for pointing out my error!!! It has been corrected!